Consider flipping through a fashion magazine for a minute: Sandwiched between glossy pages of advertising with models in ecstatic surrender to the sheer beauty of any given potion of seduction, you will find editorial guides that teach you that fragrances are classified in olfactory "families" and that they develop like music "chords" into top notes, heart notes and base notes, built into a "fragrance pyramid": maximum volatility* ingredients first; medium-diffusion materials following them after the intial impression vanishes; tenacious, clinging for dear life materials last. That should make it easier, right? Well, not exactly. The thing is most contemporary fragrances are not built as neatly and the bulk of fragrance descriptors are written with a marketing consideration to begin with. It's not a plot to mislead, but the industry is still shrouded in mystery, offering a rough blueprint rather than an analytical Google map into the largely uncharted terrain of fragrance composition. After all, look what happens with "perfume notes"; we're given the effect in the press material but the real ingredient hiding behind the fragrance note is something else entirely. Consider too one of the tightest traditional perfume structures, the "chypre" (the name derives from the homonymous archetype perfume by Francois Coty, in turn inspired by the ancient blends from the island of Cyprus, i.e. Chypre in French): a harmonious blend (i.e. an accord) of bergamot (a citrus fruit from the Mediterranean basin), labdanum (a resinous extraction from rockrose) and oakmoss (a lichen from oaks). This compact form, like a musical sonata, has a clear progression of themes, from elegantly sour to resinous/sweet, down to mossy/earthy, but all work together in simultaneous harmony, becoming more than the sum of their parts. On top of this basic skeleton perfumers may add flowers, fruits, grasses or leather notes, giving a twist to this or that direction like a shift to a kaleidoscope; this allows them to flesh out the core's striking bone structure, just like makeup accents luscious lips and expressive eyes over solid jaws and prominent cheekbones. Not every fragrance is built on the pyramid structure (or the "chypre accord" for that matter), nor is it a foolproof guide of deciphering a perfume's message. Guerlain's Après L'Ondée (1906) plays with the contrast of warm & cool between just two main ingredients: violet and heliotrope; the rest are accessories. 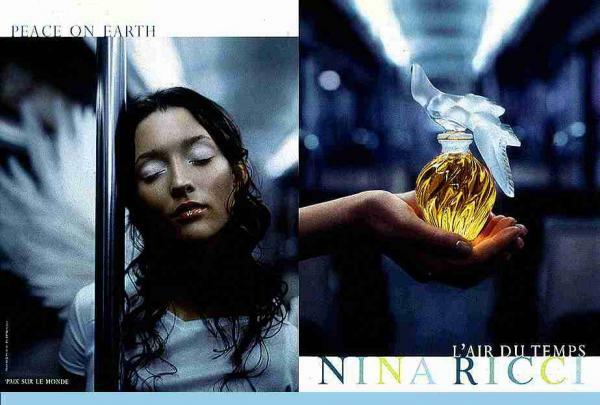 Comparing Guerlain Shalimar (1925), Nina Ricci L'Air du Temps (1948) and Lancôme Trésor (1990) we come across three different styles of composing, of structuring a fragrance: The first is reminiscent of older-style fixation of natural ingredients (lots of bergamot) via the triplet of animal products (civet, an animal secretion), balsamic materials (benzoin, Peru balsam) and sweet elements (vanilla, tonka bean). The second is pyramidal. The third is almost linear, the same tune from start to finish, a powerful message on speakers. In linear fragrances the effect is comparable to the unison of a Gregorian chant: the typically fresh top seems entirely missing, replaced by trace amounts of intensely powerful materials boosting the character. Lauder's White Linen or Giorgio by Giorgio Beverly Hills are characteristic examples. Sophia Grojsman was in fact the one who introduced this minimalist style with maximalist effect, composing an accord of 4-5 ingredients that comprise almost 80% of the formula (as in Trésor, based on a formula originally made for herself). This accord was then flanked by other materials to provide richness and complexity. Times have changed, fragrance launches have multiplied like Gremlins pushed into the ocean and consumers' attention span has withered to a nanosecond on which to make a buying decision. No wonder contemporary perfumes are specifically constructed to deliver via a short cell-phone texting rather than a Dickens novel published in instalments in a 19th century periodical. Other considerations, such as robot lab compounding, industry restrictions on classical ingredients due to skin sensitising concerns and the minimalist school of thought emerging at the expense of Baroque approaches, leave recent launches with increasingly shorter formulae. But that's not de iuoro bad either. One of the masterpieces of perfumery, Guerlain's Mitsouko, consists of a short formula! A succinct, laconic message. Some fragrances are built like a contrapuntal Bach piece and others like Shostakovich: Comparing a fragrance by Jean Carles or Edmond Roudnitska with one from Sophia Grojsman or Jean Claude Ellena are two different experiences. That does not mean that contemporary perfumes are devoid of architectural merit. On the contrary. Refined compositions like Osmanthe Yunnan or Ambre Narguilé (both boutique-exclusive Hermès, called Hermessences) showcase the potential of this school. Structure is not only given by arranging the volatility of ingredients. It's how each material plays its delineated role into achieving the overall fragrance. Structure is consolidated by using the requisite materials and ratios to provide what is commonly referred to as "the bones" of a fragrance. Most often these materials happen to be synthetic, because they consist of a single molecule (in contrast a natural, such as rose absolute, can contain hundreds of molecules), they're stable and produce a closely monitored effect in tandem with other dependables. For instance Grojsman's Trésor uses a staggering 21,4% of Galaxolide, a synthetic "clean"/warm smelling note. Jean Claude Ellena is famous for maxing out the technical advantages of woody-musky ingredient Iso-E Super in his fragrances for structure and diffusion. In the end structural analysis is for the professionals. The wearer can experience the fragrance linearly, circuitously or languidly; it ultimately depends on his/her sensitivity, perception, attention-span and education. What a lovely article!! Trully I agree, perfume is perceived differently by every one of us like art is. So so many perfumes in the market nowadays I personaly try to smell as many as possible but I have come to the conclusion that the ones I end up adoring either share similar notes (differently combined) or the same perfumer.. It is a small guideline for me !! Up till now I lived in the assumption that heliotrope made the difference between Apres l'Ondee and L'Heure Bleu. And that the hedonistic odalistic (just made that one up) effect of L'Heure Bleu was due to the heliotrope, while Apres l'Ondee was restrained and melancholic because of violets and aniseed. Even told everybody else about it on nst! But dear Perfumeshrine, as this is clearly not the case, then what does make the difference between AlO and LHB? I'm glad we agree, as I always think the ad copy of fragrances rarely makes sense nowadays: the structure is different than presented and the pyramidal model seems just a "tried and tested" way of communicating something about the fragrance. It's truly practial you consistently lean to specific notes and specific "styles" (as embodied by specific perfumers) as that means you have a very clear cut distinct style of your own! That's very handy when trying out things. And shows a definitive personality in your perfume wearing. thanks for bringing this fascinating discussion here. Well, don't beat up yourself on this, as you might be perceiving the two fragrances so differently due to a simple fact that often goes so underanalysed: difference of concentration and "style". Al'O is a light, airy fragrance, "on le porte leger" as they say at Guerlain. It's not coincidence the EDT is the standard declination. It's meant to be ethereal. LHB on the other hand is much more full-bodied, much more complex and usually presented in EDP (where it shines better, though my own preference is for the defunct PdT which was sublime and the only version I really really liked). My point: It's possible that these merely technical difference made you notice that much more the heliotrope in LHB and not in AlO. But of course there is a structural difference too: AlO relied in novel at the time ingredients (such as the aubepine aldehyde, the heliotropin, the violet ionones discovered in 1893 by Tiemann and Krüger...) uniting them in a non novel way, through old-fashioned simpler accords. In LHB the advancement of the Guerlain style, the evolution of modern perfumery and the influence of Coty himself have resulted in a very complex composition. The floral heart is much lusher (including rose and jasmine beside the heliotrope), the effect spicier (there's also clove and coriander besides the aniseed, if I'm not mistaken) and the overall effect rather powdery floral -rather than crystalline floral- which in itself is a denser ambience. Thank you for enriching my reading perfumes. The makers often list the notes and some even (e.g. Ozmoz) allot them to the 3 pyramid steps. Does it help in guiding buyers? I am not sure! Yet, the pyramid idea is so compelling to the scientific mind: molecules take off one by one, first the ones in a hurry, the lightweights with the higher (vapor) pressure. But what happens if they decide to link arms with each other? Or - as in Terre d’Hermes - if half of the juice is a combination of some Hedione and much of Iso-E-Super? Then you have the propelling engines at work that provide a strong continuous blast. My nose can appreciate such a ventilator, but would actually love to enjoy a casual walk down from the top through the contrast and harmony of the individual notes. 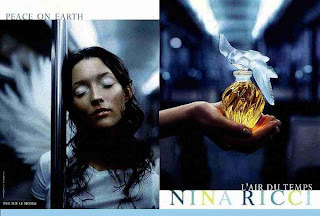 Are such perfumes out of fashion or difficult to compose? Nowadays, the key to win the prospective buyer over seems to be the initial blast. Maybe we can’t wait until the basenotes raise their character heads. One of my favorites is Light Blue from Olivier Cresp. Is the beautiful opening red apple or juicy citrus? It seems to oszillate, to change face, you want to bite the accord anyway. Then there is silence (at least for my nose). The listed middle notes (Jasmine, white Rose, Bamboo) seem to be alluringly hidden, a low-key adagio between top and base, as now the wonderful soft woody-amber-musk accord (ambroxan, amberketal, norlimbanol, musks) appears on the stage, and you don’t want to let go. The pyramid listing of the notes did not provide any clue of the fine architecture of this fragrance and the beauty of the first and third movement. this article has just pushed me to say how much I enjoy reading your blog. I have only recently begun to explore the world of perfumery beyond the standard range of department stores (because I was so annoyed there was so little there that I could like) and this site is giving me much needed knowledge about notes, materials, history and cultural context that I can at least try to lean on when choosing what to sample next among all the options! Dear Elena, thank you for your beautiful and enlightening answer! Knowledge and insight enriches the capacity for appreciating scents - an unexpected ray of sun on a rainy, rainy day in May. Apart from the interesting topics you chose, Elena, I am fascinated time and again by the solid structure of your sentences that are populated with a choice of words, illustrating your ideas perfectly. Your writing seems to be constructed similarly to a fragrance pyramid, where the volatility of the language elements pierces our mind and leads to the very heart of the idea your are conveying to us. It's a real joy to read your 5 star articles on perfume. As you say, the architectural part of a fragrance is often compelling. When there's a deliberate effect of making some elements recede in the background and others surfacing upwards on the foreground it's exciting to watch the real formula itself tell its own tale. JCE is indeed a master at this game, combining unexpected elements to conjure something completely alien to them. Light Blue is really interesting as an example too: the citrus-apple shampoo top over the woody ambers and the musks, as you succinctly describe. this is the kindest encouragement an author might wish for. Thank you!! thanks a lot for your lovely compliment and for your requests. I do like to receive requests! It helps me provide useful content. you're most welcome, don't mention it. Pleased to be able to help along, when I can. wow, blushing on such profuse compliments! I just hope to manage to be as clear as all that all the time. It's a commitment, having such discerning readers. What a lovely and informative post! The pyramid is necessary for proper construction of an all-natural perfume, as the vapor pressure of the complex natural raw materials is a difficult dance to capture. Additionally, its structure helps when we are conceptualizing subtle bridge aromatics between the t/m/b. The idea of fixation can also move into the middle notes I've discovered, and sometimes a top note isn't necessary, such as in my Amberess. I know that many who use synths can march to a different drum when composing, but the pyramid is a tool I find invaluable. invaluable information as always! Thanks for adding your expertise. Indeed the puramid is a useful tool. It makes sense that natural perfumers would follow it to a T (Jean Carles after all laid the bases for much of the architectural merit of constructing intelligently and purposefully). Perfumers spanning both worlds (and focusing on the extra diffusive and "stabilizing" effects of certain synths) do tricks to bypass this, true. Of course I'll be happy to contribute to the fixation article. Take care, dear Elena. Well all I can say in all humility is: "My questions ROCK!" I yet have to construct a proper chypre and I harbour an irrational dislike for citruses so I noticed that my perfume attempts are base, more base and maybe some more base. First and foremost, I love resins. Maybe it's why in my creations there's a strong base note perceptible from the beginning, especially if these are the louder ones like vanilla (while oakmoss or benzoin tend to lurk from behind and even if perceptibly there, they're less noticeable). The office orangier is now in full bloom and this place smells heavenly. I have a jar of neroli somewhere, gotta try a proper cologne someday, not just the smoky resiny stuff. And I second those who call for more such informative articles. A good cologne is worth its (molecular) weight in gold. A bit of smoky stuff in the bottom would make it just the thing! (love that contrast myself). An orangier in bloom is a heavenly thing indeed. I raise a grateful toast to the powers that be that almost all the streets in my city are flanked by bigaradiers. Spring is so darn fragrant! Thank you for this thought provoking article. It reflects my thoughts on whether we can really call perfumery an art. I have not made up my mind yet... Art is usually associated with a theoretical background, research and common language for the description of a work of art. Differences in appreciation surely exist but how can one convey their personal way of approaching a fragrance to the others? I have a question in terms of how to construct a perfume. I dont know if my question makes sense or not, but for instance....do I make the base accord in one flask, the heart accord in another flask, and the top accord in the last flask, and then combine the heart accord to the base, then add the top accord? Or do I for instance, establish the base notes, then one by one add the heart notes, and then the top notes? Perfumers working with the classic Jean Carles method of the "pyramid" begin by building the base chord and then adding to it slowly the heart and then the top notes. This can be done in both ways you describe with the separate chords in different flasks presenting the advantage/disadvantage of wasting more or less of respective ingredients. For a great, comprehensive and easy to follow method of constructing a classic pyramidal structure, I highly recommend Essence & Alchemy by Mandy Aftel; it explains everything in simple to follow steps. Karen Gilbert's Perfume book is also great for the amateur perfumer, offering recipes that one can use as a blueprint and several scent products "structures".